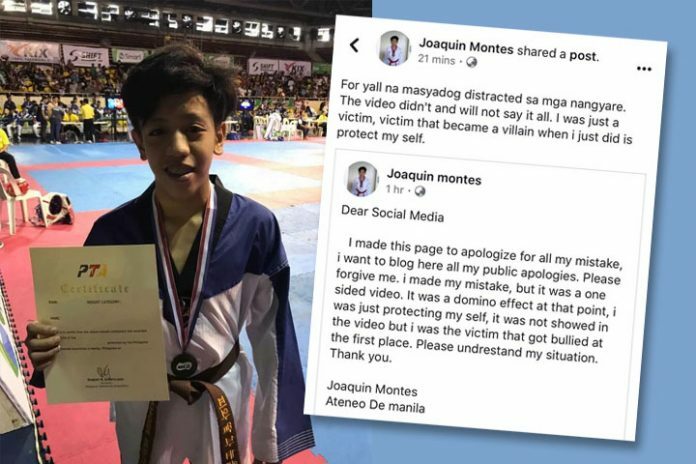 Joaquin Montes dubbed as ”Bully Atenista’ (Ateneo De Manila University moniker) made headlines after a video showing him bullying a schoolmate went viral. He claimed it was self-defense. What’s unique about Joaquin is his very short height with a brazen attitude. Although Montes posted an apology in his Facebook, his rhetoric is seen as ‘victimhood’ and with little remorse. Ateneo is considered one of the top Universities in the Philippines. His dad posted a message defending his son’s action made things worse. It prompted a veteran army to challenge him in a video. “I blame the parents for that,” Joseph Otazu said. In other videos, it shows a brave Joaquin who knows Taekwondo hitting another boy much taller than him. A week after the incident, Diego, his older brother was rumored to have been flogged. He is so hated by many Filipino netizens that more than a hundred fake Facebook accounts were created in his name to spite him. Recently, allegations that he is involved in drugs is making rounds. True or not, news about Joaquin is so bad that some politicians have intervened. Some men are insecure about their height and can trigger a certain attitude to compensate, or was Montes’ brusque and belligerent attitude a result of bad parenting? Those who have low self-esteem who use aggression. Those with high self-esteem and have high status in the peer group, who use aggression to seek rewards at the expense of their victims. [NCBI]. → Seven Biblical lessons for kids to have high grades. → Gifts you should never give to kids below 12 years. Viral video screen grabs of Joaquin Monte, seen with aggressive behavior. What does God expect from parents? 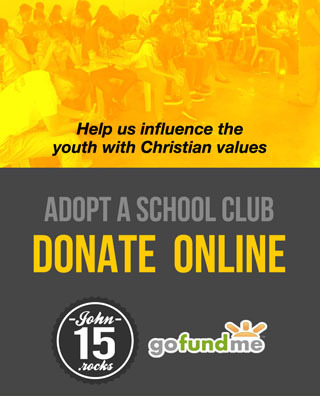 God sometimes ‘gifts’ us difficult children because we’re the only ones who can love them unconditionally, not others. Kids can be mean sometimes. Retaliating with more meanness will only produce exasperation [Ephesians 6:4]. God could be teaching you to be forgiving, patient and loving [Ephesians 4:2]. However, if a parent tolerates this behavior and without proper discipline, the child will grow up disrespectful of others. If you think you’ve done all you could, the only constant thing you can do is to pray. One of the best gifts parents can give is to pray for their children each day, even if they’re all grown-up. Remember, for kids to have a good character, we must demonstrate we have it or most of it. If your child has deep insecurity, affirmation is critical, but only God’s love can heal all insecurities. For our kids to have a good character, we must first demonstrate we have it. 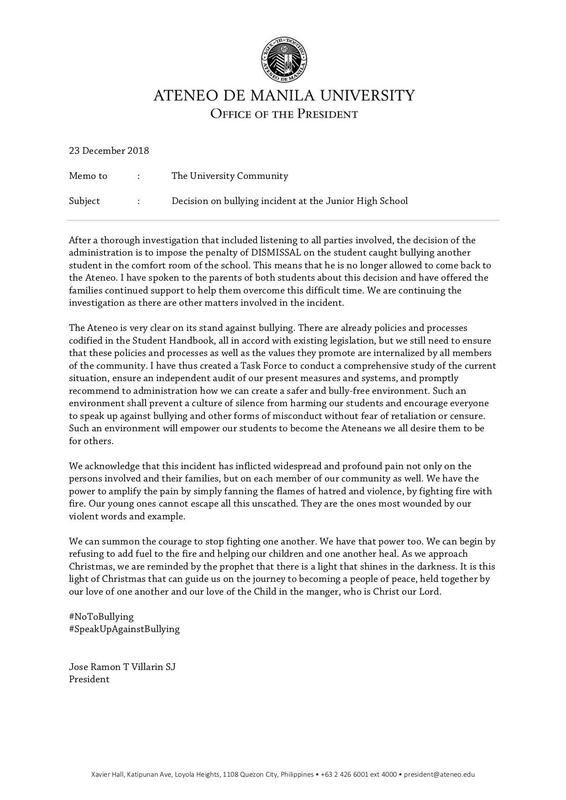 Ateneo De Manila University released a final statement on the incident. After a thorough investigation and listening to all parties involved, ADMU imposed the penalty of ‘dismissal’ to Joaquin Montes on December 23, 2018. This means Montes can no longer come back to the school, the memo said. Montes and her mom appeared on GMA TV on January 9, 2019, to apologize. The young man had no remorse, the host insinuated. His mom’s apology was insincere and defensive, said most of the YouTube netizens. With Joaquin’s Dad similar stance on the issue, it will be difficult for the family to move on without being bullied as well online.